"When God created the first man, He got the bones from a Basque graveyard." Tracing back through the history of the Basque, we find a resilient and persevering people. Basque Country has been a destination, a crossroads, and a crucible for history. Basque people have exhibited a high standard of ethics, and demonstrated the willingness to sacrifice for the good of all. Between today's France and the Iberian Peninsula, the Basques have watched waves of people intrude upon their land: from the frustrated Roman attempt to conquer; to the Vikings who visited every year, to the Visigoths who overstayed their welcome, to Charlemagne's legions on route to push the Moors back across the Straits of Gibraltar; to the loss of the whaling and cod fishing industry they had enjoyed for thousands of years; to the political wrangling over territories and boundaries during the 1500s; to the loss of their shipping industry as they were caught in the conflicts between Spain and England; to the bombing of Guernica by the Nazis as a demonstration to the world of their ruthlessness at the onset of WWII, which then prompted Basques to smuggle thousands of fallen Allied flyers back to safety in England; and, to Franco's introduction of thousands of immigratingSpanish civilians (ostensibly to relieve a lack of workers) for the many industries in the Basque area during the 1970's. Through all this and more, the Basques remained true to themselves. Through modern times, familial ties, common culture and language remained strong. The flow of Basque multitudes took to and brought back, from around the world, the wealth of their extraordinary culture. 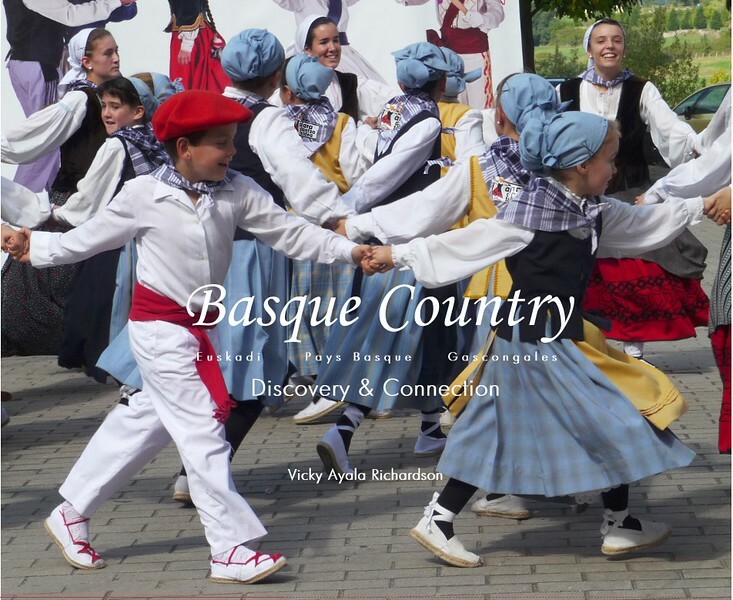 If you would like to purchase an 8.5" x 8.5" paper back, "Basque Country Discovery & Connection", $20, use the Add to Cart button.